The history of Artsakh (Karabakh) started from immemorial times. The name of Karabakh is relatively new and mentioned in Georgian and Persian documents of the XIV-XV centuries. According to the legend it means “Aramaniani” – son of Haik Nahapet, “tsakh” – tree, forest, as he ordered to plant forests and fruit-trees. Later this word combination transformed into Artsakh. According to another legend, recorded at the end of the XIX century, the name of Artsakh came from the words “sar” – mountain and “tsakh” – forest, i.e. mountainous and forestry (the main factors of local landscape). Every valley in Artsakh is original and unique. In this beautiful country there are many churches, monasteries, ruins of old settlements, bridges, castles, springs, mills, khachkars, and cemeteries. 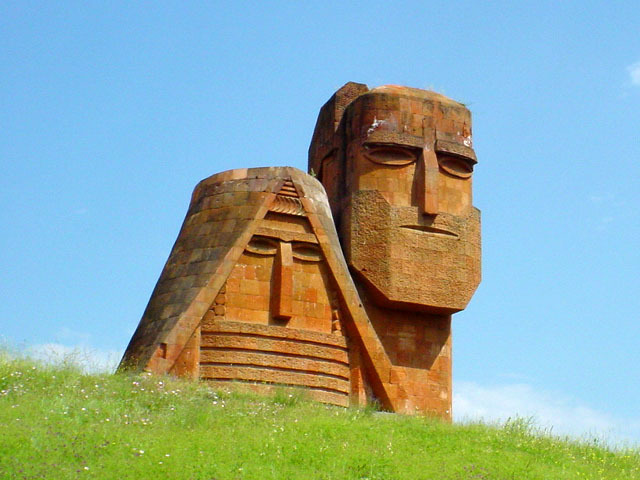 Considering many old inscriptions, we may say that Artsakh is a real historical-architectural and archeological museum. Almost all the mountainous parts of Artsakh are covered with forests. Artsakh is rich with nut and mulberry forests. Mulberry vodka is very healthy. Not far from the main road of Stepanakert – Karmir Shouka, close to the Skhtorashen village of Martuni district an old majestic platan tree is growing. According to archeologists, it is more than 2 thousand years old. In the beginning of the bygones century it was under the protection of Russian Tsar (10 golden rubles were dedicated to protect this tree). The tree is huge with the height of 25-30 meters and circumference of 29 meters. The hollow in the trunk is about 7.5 m. in diameter. The pride of Shoushi city is Saint Amenaprkich Ghazanchetsots cathedral which is in harmony with Shoushi. Construction was started in 1868 under the reign of Russian emperor Alexander II, and was completed in 1888 when Alexander II was crowned. The Gandzasar monastery complex is the most wonderful treasure of Armenian architectural history. Great expert of Armenian architecture Jakobson called it a “Pearl of Armenian architecture”. Construction of cathedral monastery started in 1216 and was completed in 1238. Construction of vestibule adjoining to the church from western side was completed in 1266. The cross ridge of Karabakhy and Mrov mountains form a small mountainous valley. The monastery Dadi or Khuta – a majestic architectural memorial is constructed here on a hill. The nature of this land is extremely beautiful. Amaras monastery situated in 10 km southeast from the center of Martuni. It was founded by Grigor Enlightener in the beginning of the IV century and was completed by his grandson – bishop Grigoris. Mesrop Mashtots opened the first school in Artsakh at the beginning of the Vth century. Amaras monastery was distroyed many times by tartars and turk-seljuks. But it was always reconstructing. “… Khachkar, Armenian phenomenon, is a symbol of Armenia. The cross cut in stone symbolizes all torments, sufferings and blood that the history demanded from an ancient small nation. Plant ornament, covering the background of the plate symbolizes vital power of this nation. Even ferocity, death and genocide couldn’t win them…” said Edward Mejelaitis. Khachkars are everywhere in Artsakh: in front of the churches, on the crossroads, in the destroyed villages and cemeteries. Most of the khachkars were made in connection with construction or rehabilitation of churches, or as a gift to a church or a monastery of any village, also with purpose of perpetuate prince’s memory – land defenders.